Holiday Inn Warsaw Jozefow is conveniently located 4km from Warsaw and around 30 minutes from Frederic Chopin International Airport. 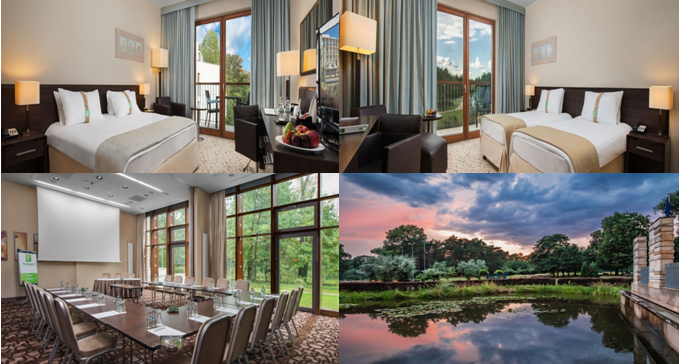 In beautiful forest surroundings but with easy access from Warsaw, the hotel is ideal for both business and pleasure. As a member of the largest hotel chain in the world �C Intercontinental Hotels Group �C the highest level of service is guaranteed. Variety of recreational attractions makes the hotel a perfect place for outdoor active relaxation for both individual guests and organized groups (fe. incentive travel). At your disposal: a swimming pool with Jacuzzi and saunas, mini gym, well-recognized brand Klinika La Perla spa, golf course with heated driving range, mini-golf and the largest rope park in the Mazovia region, tennis courts and multifunctional fields, bikes and e-bikes. Their restaurant is recommended by the first Polish edition of the Gault & Millau Guide (2015). Gault & Millau is next to guides "Main Cities of Europe" granting Michelin stars, the most credible and prestigious source of recommendations for restaurants in 9 countries. Remark: The above price includes VAT. Holiday Inn Warszawa Jozefow is located 20 km from the center of Warsaw and is perfectly connected. 1) The best means of transport is the fast city train (SKM S2 from Okecie airport to City Center and then S1 to Jozefow). And the station Jozefow is located 10 minutes’ walk from the Hotel. Copyright © 2018-2019 ISTCI.ORG All Rights Reserved.